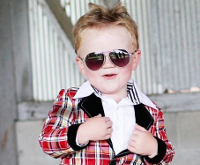 Your little man will be looking spiffy as ever in this crisp, cool and quite dapper button-down. The shirt even has an option of traditional style cuffs or spicing it up French style. He’s certain to be the center of attention! 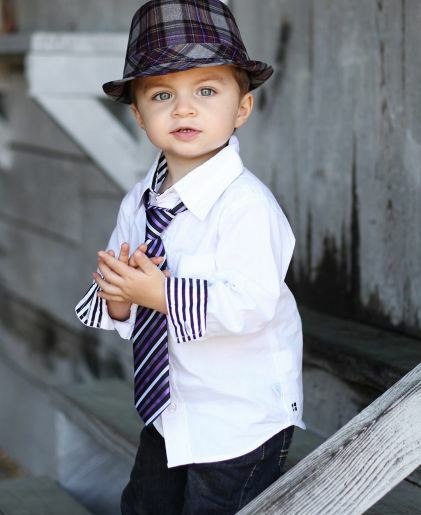 Give your mini-man some super sophisticated style with this slim-style button-down. The dress shirt has contrasting black and white fabric in the cuff and collar to make him extra suave! his shirt is not your average boys button-down. For that added special touch, we have added a black & white stripe detail to the inside cuffs and neck. Made of 100% crisp cotton. There is no neck label for added comfort. Machine washable. Dry on low, but laying flat to dry is recommended.